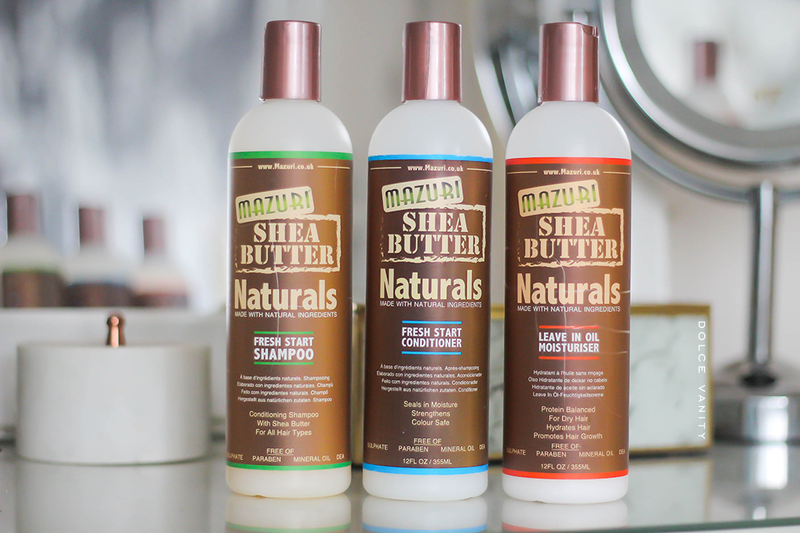 Mazuri Naturals Shea Butter Collection Review. Mazuri is a seven-strong product range of shampoos, conditions, sprays and creams that are comprised of natural unrefined Shea Butter combined with essential penetrating oils, Olive, Avocado, Sweet Almond & Sunflower Seed Oil. These ingredients have been carefully created to deliver hydration, shine and definition to mixed race, afro and all hair types. I've tried one product from this brand before, Mazuri Organics Olive Oil Hair Mayonnaise Steam Treatment. I quite liked it but at the time being a hair product junkie it was never repurchased. When I was given the opportunity to try the Mazuri Naturals Shea Butter Collection, I thought why not see what else this brand has to offer. At the moment I'm going between straight and curly quite often as the weather is significantly cooler. I decided to try the following three items Shea Butter Naturals Fresh Start Shampoo, Shea Butter Naturals Fresh Start Conditioner & Shea Butter Naturals Leave In Oil Moisturiser. The shampoo is made with natural ingredients to condition & strengthen hair whilst repairing damaged areas deep within. The conditioner seals in moisture, repairs and strengthens hair too. Leave in Oil moisturiser, can be used as a daily oil moisturiser to strengthen and promote hair growth whilst hydrating and reconditioning dry hair and repairing damaged bonds, can be used on damp hair as a blow dry lotion. These bottles are pretty large at 335ml each and the shampoo & condition have a RRP of £6.99 and the leave in oil moisturiser is RRP £6.69. Which I find very reasonable especially if they're effective. With anything we do, having a good clean, well prepped base is what gives us the best results we want and our hair is no different. Overall I've been using these for all my wash days since receiving them, even after colouring my hair also. I like the leave in oil moisturiser, I will use it to blow dry and straighten my hair and I have the most lightweight but moisturised hair. Even putting a small piece through before sealing with oil is amazing and gives me great results. The shampoo & conditioner also are effective in not stripping my hair while washing but I know it's clean and also the conditioner doesn't coat my strands but I can feel they're hydrated. I definitely would repurchase without a doubt. I'm not even half way through the bottles and I've had these for a little while now and wash my hair 1 - 2x a week, the 335ml is worth it and the price is budget friendly in my opinion. What have you been loving for your hair lately?